Indian Khana, Made Easy: Friday THE 13th Dinner Date, A Curse or Luck? Charlie Brown's, Nathan's Hot Dogs, Ruby Tuesdays, Carl Jr's and so on are some of the American restaurants that I heard and know of. Do you know what all of them have in common? Most if not all are named after a person, probably the owner. Now take a crack at these restaurants: Tamarind, Cinnamon, Clay Oven, Dosa Hut, Rasoi, Swagat, Chola, Chennai Garden, Dawat, Udipi, and Saffron. Can you see a trend here? I've noticed that a lot of Indian restaurant names are derived from our cooking and/or the region of the cuisine. I start thinking about the flavors and the types of dishes that they prepare and before you know it, I'm salivating...you get the point. I don't get the same feeling with American restaurant names...too bland. One of the restaurants that I found interesting is Saffron located in East Hanover, NJ. You don't have to be a cook to know what saffron is. It's not just an ingredient used in Indian cooking, but also in other parts of the world such as the Middle East and Latin American countries. You know what else, it's expensive and hard to find. So it got me thinking, if someone named their restaurant after such a "royal" ingredient, their food must be delicious..at least those were the thoughts running through my mind. Well, I can tell you the decor of the place was pleasing. The dining area was adorned with wooden carvings, tapestries, and paintings; and it wasn't gaudy. The menu was reasonably priced and they serve buffets Monday through Friday, if you're interested. My parents and I have tried the buffets a couple of times and found the food to be good and I decided I would tell others about it too. The following is about an outing to this restaurant where I had the most memorable experience. My friend had nothing else in his mind except Butter Chicken. I, on the other hand, was just hungry after my intense Zumba class. I recommended we go to Saffron for dinner since it wasn't that far from the gym. We immediately got seated and searched through the menu for his favorite dish. After surveying the menu for several minutes, we both realized the item in question wasn't there and decided to leave. Just then, the waiter walked over and asked for our order. We asked if they had Butter Chicken at all since it wasn't listed on the menu? He said although it's not on the menu, they can still make it. Right then and there, bells should have rung in my head, if it isn't listed maybe it's not that great. However, we decided to stay and ordered some appetizers to go along with the main dish. The last time I had dinner here, my parents ordered Crispy Veggie Fritters and we all agreed, they were really tasty. 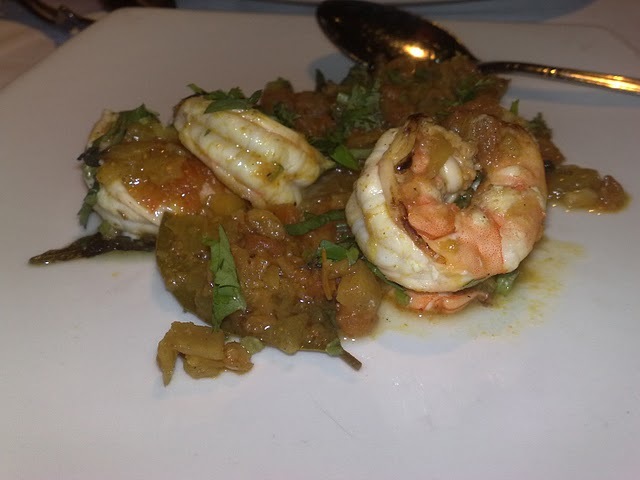 So, of course we ordered that plus Shrimp Balchao (Fiery pan-fried shrimps with chili based masala). If a picture can speak a 100 words, this wasn't it!! We both agreed that the shrimp dish could have been more flavorful. The sauce had just the right amount of spices and taste, but the shrimp was bland. They are vegetables dipped in flour and fried in oil. If they are prepared well, the veggies should still be crispy, hence the name but somehow some places always mess it up. Now, that doesn't mean they taste bad. They are still pretty good but if you are worried about oil and fat then you wouldn't be too thrilled. 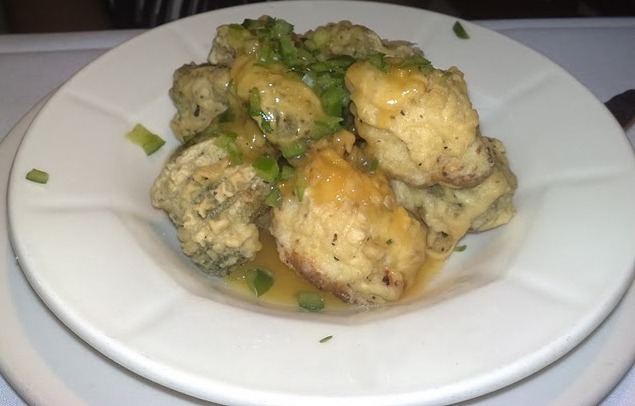 Just look at those fritters, do they look oily and fattening to you? There's not too much flour and YOU can still see the veggies. They were crispy, crunchy and just YUMMY!! Even the presentation is just so delightful. Ok Ok, we came here to eat Butter Chicken, remember? That's what my friend kept reminding me off so I could save room for the best part. 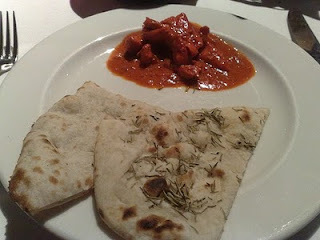 When the "Butter Chicken" arrived with the Rosemary and Paneer Naan, we were both rubbing our stomachs, eager to dive in. The naans were fluffy and hot but the chicken curry wasn't up to the standards we were expecting; especially for the price we paid. Whenever I'm feeling down, my friends try to cheer me up by saying "turn that frown upside down" and I just laugh it off. With the average taste of my friend's favorite dish, I knew I had to do something. 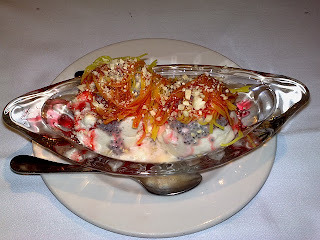 I ordered dessert and not just any dessert...the best Indian ice cream dessert that I know of and recommend to anyone who wants to try something funky and cool. This dessert is called Kulfi Falooda. One of these days, I will post a recipe on how to make it at home. Now that I think of it, there's another dessert that is cool like this and its name is ABC 3.0. I tried it at this Malaysian restaurant called Nyoya. It's made up of shaved ice with red bean, corn, palm seeds, and lotus jelly topped with red rose syrup. I think the presentation alone captured the attention of my friend. His eyes lit up and we both grabbed our spoons to go at it. I mean, just look at all the colors and the creativity. Kulfi Falooda is made up of kulfi (Indian ice cream), rose syrup, vermicelli, and tapioca seeds. It can be served on a plate as illustrated above or as a drink. If you want to try your luck with Saffron, 1) Do not go on a Friday (hint: mom told me that afterwards), 2) Don't order Butter Chicken, and 3) If you go on a weekend, expect delays in service. I was a bit disappointed with that since our whole meal lasted almost 2 hours and we didn't even order that much. I almost ate my cloth napkin waiting for my food. Overall, the evening wasn't that bad; there were some good moments. I blame Friday the 13th for any misgivings that occurred. Moral of the story: We went to the restaurant for something "non veg" but ended up loving the "veg" stuff even more. I miss falooda. Please make it soon! To celebrate, my parents and I went to Saffron and ordered Crispy Veggie Fritters with Oriental Sauce. They were so good. I would have finished them all but I had to share.